I’ve been busy trying to get some things in the freezer in hopes of making life a little simpler in the months ahead. We’ll be using the laundry room as a kitchen (with no sink), and our living room/bedroom as our dining room. Things are going to be tight and crazy. This would be an easy time to turn to convenience food. In order to avoid that, a little preparation goes a long way. I made 100ish meatballs, baked them, individually froze them, and portioned them out into dinner sized bags. I made 4 pans of lasagna 2 meat, 1 cheese, and 1 mushroom and spinach. I also froze a giant batch of tamales, the “guts” for pot pie, enchiladas, and bolognese! I’ve also decided to cut down on the prep for some of our favorite baked goods. 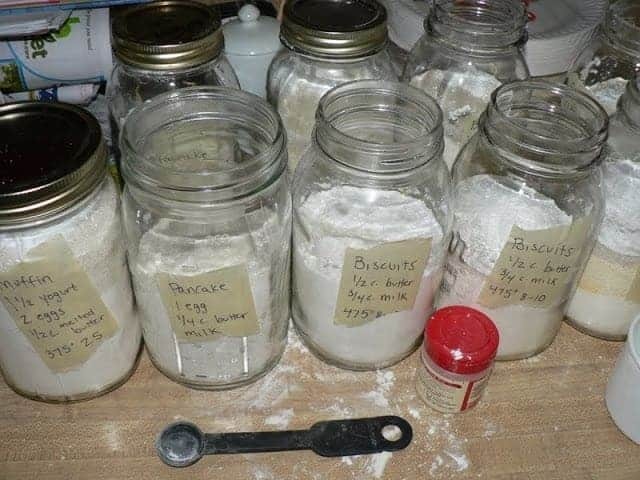 I’ve premeasured the dry ingredients for biscuits, pancakes, muffins, and cornbread.. Now all I’ll have to do is throw in the wet! I labeled each jar with what else it needs, the oven temp, and cook time! Sure the freshly ground wheat flour won’t be as wonderfully nutritious after it sits of a while in these jars, but hey, we could be eating a lot differently! you are so organized! like those meals in a bag! good job! You put me to shame. I wish I knew how to get organized. I’ve got lots of bottled meat (pork, chicken, and beef) in the storage room. Easy peasy pulled pork, chicken pot pie, beef stew…. etc. And no refrigeration! how do you bottled pulled pork, etc? I’ve always been afraid of bottling things because of botulism. I do dry canning, I don’t know if it helps or hinders the nutrition content but most things will still be fresh in 20 years, as long as there is no nuts or oils in them, I guess I need to do more reasearch on how the nutritional value hold out. Thanks for posting these recipes , I plan on using a lot of them.